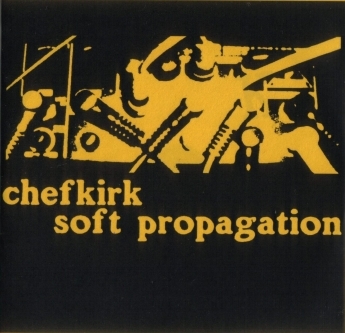 DSC#076 - chefkirk - "Soft Propagation" - Full Length CD-R "Soft Propagation" is the newest full length by Eugene, Oregon's chefkirk.>br> It's an intense and extremely focused study in high frequency sound manipulation, using nothing more than a no-input mixer, boss sampler and a micro-cassette recorder. With almost no bass present, Roger creates walls of feedback, micro-tonal rhythms, crystalline drones and massive waves of static. Shattered glass, snow, sand, concrete, insects, decayed paint and rust are just a few of the words that could be used to describe this album. Pure electronic energy in a high frequency zone few chose to seek out. We're very happy to have it here at DumpsterScore! 16 untitled tracks clocking in just shy of 50 minutes. Hand stamped high quality discs, with b/w artwork on yellow paper in a vinyl sleeve. Artwork by A.Q. Limited to 50 hand numbered copies.